The Carlisle ACT is a radial tire that is used as an OEM tire on many Polaris & Can Am model ATVs right from the factory. It's radial construction provides a very smooth ride and helps the tire wear longer. You will notice an increase in handling as well compared to a standard bias ply tire. The ACT is great for all-purpose riding. If you do moderate trail riding and need something to perform in a variety of riding conditions, this is a great choice. It will give you the traction you need when you need it, but not so aggressive that you sacrifice your ride or fuel mileage. 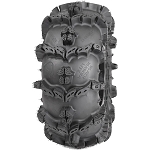 - Carlisle ACT ATV Tires are sold individually. 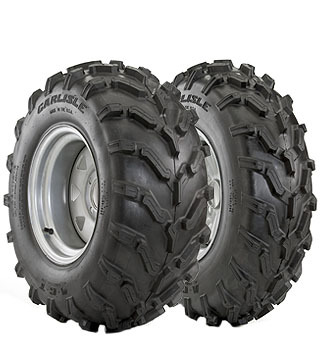 - In most cases our Carlisle ATV tires ship out within 1 business day! 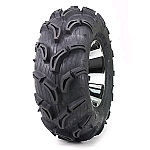 - Great all purpose ATV Tire. - Excellent for trail and mud conditions. - Designed for both wet and dry conditions. 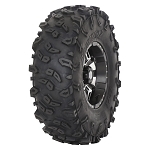 - OEM tire of choice for many brands of Quads. I love these tires, I put them on a 2011 Honda Foreman, and they totally out perform the factory tires. They do well in all the conditions I use them for., The garden, creek beds, hills, water,mud, but not extreme mudding, awesome trailing and rocks. They handle very well and don't bounce me around everywhere. I actually talked to the guy that does the videos and he helped me alot. I got my tires exactly when he said they would be here. Good company to do business with. 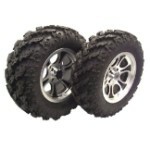 These tires are standard on the 2010 Can Am 500XT. They are decent tires, but I've had two front tires cut in the sidewalls from rocks. Tires are 3-ply. I will upgrade to a 6-ply in a year or so. Pureoffroad is an excellent on line retailer. I ordered this tire Thursday at about 4:30 PM and it arrived Fed Ex on Saturday, no shipping cost!! I am very happy with the service and got exactly what I ordered at a very decent price. Excellent tires. 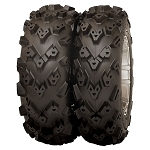 Have never had the radial tires before for the ATV until these, and they are GREAT! Ordered these Carlisle tires and replacement rims for my old Arctic Cat and could not be happier. The price was about 20% less than what I was prepared to spend on Amazon from other dealers selling "kits". Pure Off Road provided the tires and rims that I wanted through a easy to navigate website with straightforward and no gimmicks or add ons. Give them a try - you will be glad that you did. These are great needed replacement tires on my 12 650 outlander. Did not want oversized tires on this one. Did that with the 800 had axle problems. Excellent product and great service. A: I don't think there is any difference between the ACT used on Can AM and Polaris. Yes the HD's are still available. The HD has a 1 inch tread and it's a heavy duty 6 ply carcass. The regular ACT is a 3 star rating with 3/4 inch tread. Q: What does the act stand for? Q: What size of wheel is use for 23x7-12 tire? A: Yes we have these in stock.